The latest travel writing, destinations and images from Roderick Eime with a few pithy observations of this vague artform. When the world’s greatest navigator needed a break from the rigours of exploring, he headed to New Zealand’s lush South Island. But his idyllic sanctuary held a dark and terrifying secret that struck mortal fear into his men. The land of the long white cloud was little more than a figment of the cartographers’ imagination when Lieutenant James Cook sailed into the eastern coastline on his way home from Tahiti in October 1769. Seizing the opportunity to further expand his realm of exploration, Cook spent the next seven months circumnavigating the two islands and created charts so accurate, it took the advent of satellite mapping to improve upon them. In January, Cook had completed his charting of the western coast of the North Island and, whilst sailing due south, discovered what he mistook for a large harbour. In a rare moment of self-aggrandisement, Cook named the strait after himself, but the ferocious seas soon had him looking for shelter. He aimed Endeavour into a small inlet and was quickly overwhelmed by the stunning topography of the seemingly endless narrow waterways. Eager to go ashore and doubtlessly urged on by botanists Banks and Solander, Cook pushed his tired ship into a cove for rest, resupply and repairs. While the scientists frolicked amongst the giant ferns, Cook set out to explore on foot and was soon climbing the nearest hill for a better look of his new found paradise. All around him was lush forest replete with giant trees ideal for a ship’s mast. Fresh water and edible greens were plentiful and fat fish virtually jumped on the hook. Taking stock of his wonderful surroundings, Cook named the area Queen Charlotte Sound after his king’s consort and the little bay where his ship was anchored, Endeavour Cove. So impressed with his find, Cook would come back again and again to rest his People (crew), his ships and himself in this cove on his next two monumental voyages. His much envied record of keeping a healthy crew, free from scurvy is due in large part to his judicious use of layovers such as Queen Charlotte Sound. His men, however, were far less sentimental about the welfare of the ‘savages’, especially after the unsettling discovery of human remains in one of the Maori camps. To drive the point home, one of the inhabitants grabbed a fresh femur and proceeded to chomp voraciously on it for his guests’ entertainment. That event alone sowed seeds of horror and dismay amongst his crew. They literally trembled in their bunks at the thought of becoming a Maori main course. During his landmark second voyage aboard Resolution (1772-1775), Cook became separated from his escorting ship, Adventure. Captain Furneaux of Adventure, although impressively credentialed, was no Cook. Stubborn and narrow-minded, he kept a poor ship and his crew suffered badly from scurvy despite Cook’s emphatic advice about diet. During the homeward leg, Furneaux was beset by a storm and forced to return to Queen Charlotte Sound. Eager to leave, but short on supplies of scurvy grass, Furneaux sent a crew of nine to gather the life-saving antiscorbutic plant. The crew failed to return and a second boat, under Lt. Burney, was sent to find them the next day. The scene that Burney witnessed was one of total horror. Shoes, fragments of oars and baskets of roasted flesh lay strewn on the beach. A tattooed hand, complete with the owner’s initials was another grisly find and irrefutable evidence of the event. An enraged Burney and his men spent the next few hours vainly chasing the scattered Maori, firing shots and destroying the few canoes they had left behind before finally retreating at dusk and returning to Adventure with the “melancholy news”. Was Cook guilty of a political cover-up? Or did he seek to erase or excuse the event in order to preserve his own cherished memories of this Eden of the South? Captain James Cook’s three 18th century voyages to the Pacific changed the world. Cook’s Pacific Encounters showcases an extraordinary selectionof Pacific Islands artefacts which were taken back to England from these voyages. An exhibition of rare, 18th century, functional and spiritual objects collected in the Pacific islands byCaptain James Cook on his second and third voyages. The 300 objects are rich in craftsmanship and spiritual power and were given as gifts or traded with Cook by indigenous people from locations including Tonga, Tahiti, New Zealand and Hawaii. Now, call me an old fuddy-duddy, but as an early adopter of the Internet (first pages published mid-90s) I've seen most of the good, bad and ugly of the web and social media even before it was called that. As a former university photojournalism lecturer, I do believe I have an eye. Two in fact. And both give me the same feedback when I see some Instagram feeds. I'm singling out Instagram because it is the pre-eminent visual social media tool and one that seems to be 'hot' right now. Okay, and Pinterest. But let's stick with Instagram. Perhaps I'm not the right guy to be jabbering on about Instagram as I have a pathetic number of followers and I don't own a swimwear range and would fail the Men's Health cover model test. Badly. The 'Belle Effect' is an age-old syndrome already rife across all our media platforms. When will we learn? 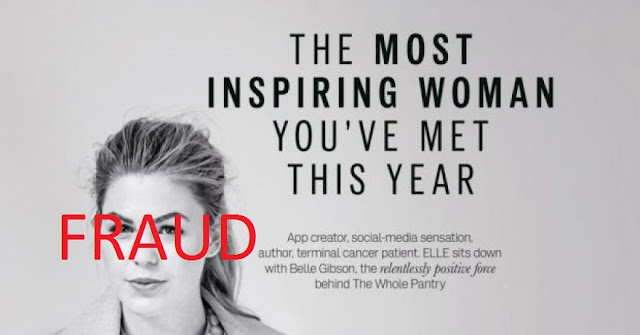 Australia’s Federal Court in Melbourne has handed down a verdict following an investigation by Consumer Affairs Victoria (CAV) which determined that the blogger and self-proclaimed cancer survivor, Belle Gibson, had misrepresented herself and made fraudulent claims. In a landmark case that should get the attention of all social media gurus and ‘influencers’, it highlights the vulnerability of the public in getting their news and advice from so-called experts via unverified social media sources ie #fakenews. A glaring case of ‘people believe what they want to believe’, fueled by a popular media hungry for sensation and a complete lack of fact-checking in their rush jump on the bandwagon. Freelancer or Freeloader: the quest for the 'free lunch'. 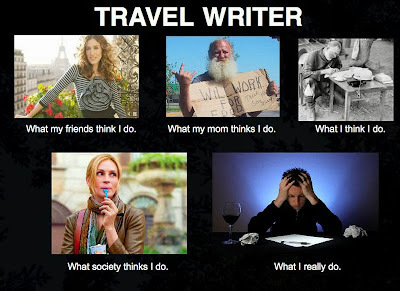 It’s one of those things all professional travel writers have to endure. Continually being interrogated by fellow travellers, family members and other office-bound journalists is something I always dread. While there is always varying financial participation by all parties in any given familiarisation trip, there is an old truism that always holds. Now legend has it, that once upon a time all a journalist had to do was call their mate at the airline and a First Class ticket came by courier with a bottle of French Champagne. Now, there might be one or two esteemed scribes still alive who can command that kind of worship, but let me assure you, my dear reader, those days are OVER.